Gallows Rock is a single level fort occupied by the Silver Hand. Four Silver Hand guard the outside and a locked random loot chest can be found in the remains of the tower. If you are here completing The Silver Hand quest, then you can loot the corpse of the dead companion for wolf armor and boots. Searching the outskirts of the fort will turn up the treasure chest for Treasure Map VII. Dungeon Delving: Do a favor by retrieving an item from a bandit hideout. Harsh Master: Take care of a runaway crew member. Kill the Bandit Leader: Do a favor by slaying a bandit leader. You enter into a room that has a spear gate blocking the way forward. A pull chain on the stone pillar directly in front of you when you enter disables the spears. There are two imp stools growing in this room. A woodcutter's axe is immediately on your right upon entering and a pickaxe is behind the pillar with the pull chain. The path onward leads downstairs to the south. At the bottom of the stairs is a room off to your left, with an empty cart in front of you, a hay bale next to it has a wooden bowl containing an eidar cheese wedge. You will pass three of five stone pillars to move into the room proper. On your right by the wall along from the hay bale is a bucket containing a pickaxe and an iron ore sample. In the center of the room is a camp fire with a skeever cooking on a spit over it. There are two chairs, one on either side of the fire, with Silver Hands sitting in them. Next to the nearest chair is a wooden block with a salt pile and rabbit on it. Near the other chair is an unlocked chest, an iron sword, and an iron shield. Against the northern wall is a table and bench holding a potion of extreme healing, two leather strips, a horse hide, and several ruined books. The northeast corner has an archery target, and next to this is a set of shelves containing bulb of garlic, a loaf of bread, a sample of lavender, and a drum. There is an open door on the east wall leading into a small room with a dead werewolf hanging from the ceiling. Also in this room are a set of rare torture tools, a cast iron pot containing two briar hearts, and a pine thrush egg. To the right of this door is a bucket containing vegetables. There are two additional doors in this room, both closed. The door on the west wall is barred from the other side, and to the right of this is a pile of firewood and a sack. In the southeast corner is a lone barrel. Make your way through the door to the south, and follow the corridor as it turns to the east. There is a fly amanita and bleeding crown growing along this section. When the corridor turns to the south again, you will encounter a skeever beside a table with a bottle of Nord mead, a leg of roast goat, a loaf of bread, and a seared slaughterfish steak. There is an iron dagger in a bucket under the table. The corridor leads up some wide stairs leading south. Use care at the top of the stairs to avoid a pressure plate that activates a spike wall. There are two Silver Hands at this end of the room, one patrolling up and down the corridor to the top of the stairs, and the other sitting at a table in front of you facing away from you. On the table is a garlic bulb, potion of minor healing, flute, a hunting bow, and three coins. There are two corridors running parallel north-south. The one on the left has three cells, the first and third being empty, the second containing a dead werewolf. There are several barrels, an empty cart, and a hay bale along this corridor. At the end is another table with a Silver Hand sitting facing away from you. On the table is a canis root and potion of stamina. The right hand corridor also has three cells, the first contains a dead werewolf, the second is empty and the third contains a live, feral werewolf that will instantly attack if you open the cell door. You can kill it through the cell door. Along this corridor is also a collection of hay bales, carts, and two sets of shelves. The first bookshelf contains a bottle of wine, two bottles of Nord mead, a cabbage, and two red apples. A pickaxe is leaning against the side of it. The second bookshelf contains a potion of cure disease, two loaves of bread, a goat cheese wheel, a sliced goat cheese, a sliced eidar cheese, and an eidar cheese wheel. On top of this set of shelves is a sample of wheat. At the end of this corridor there is another Silver Hand standing against the wall, unless they have been alerted previously. To the right at the top of the stairs here, there is a bookshelf that has been knocked over, on top of which is a potato, a sample of wheat, and a basket containing a cabbage and another potato. In the corner is a small table containing a red apple and an iron dagger. There is also a bed roll here. The corridor continues to the west, down a wide set of stairs. At the bottom of the stairs, on the left is an empty cart with a pickaxe beside it. The corridor in front of you is blocked by a cave in. Among the rubble is a lootable skeleton. There are a couple of crates against the north wall with a knapsack on top. A closed door on the north wall leads to the next area. Through the door is a room with two levels. There are two Silver Hands sitting at tables facing away from you on your level, and two more patrolling the upstairs level. As you enter the room there is a firewood pile on your left with a bucket containing a gourd next to it. Hanging above it is a sample of frost mirriam and a rabbit. Along the same wall is a barrel, a crate with a bear pelt on top, and a woodcutter's axe leaning against a stump. Continuing along the wall, there is another crate with a horse hide on top and a bucket containing a leather strip in front. In the northwest corner of the lower level is a hay bale beside a tanning rack. Beside the stairs is a fly amanita growing and another leather strip on the floor. There is a small table next to the bottom of the stairs with a bottle of wine and carrot sitting on it. To the right of the door through which you enter is a white cap growing among some rubble. There is a large table to the right of the first stairs holding two leather strips and a woodcutter's axe. Against the east wall is a second set of stairs leading up to a second small table with a seated Silver Hand. This one holds a wooden bowl containing grilled leeks and a goat cheese wedge. Another fly amanita is growing beside this set of stairs, next to another tanning rack with deer pelt on the floor nearby. There is another large table underneath the upstairs level on the right, holding an ice wolf pelt and snow bear pelt. On the floor underneath the table is another woodcutter's axe. There is an open door to the north of this table leading to a storage room. Inside are a total of three sets of shelves with nothing of interest except one green apple. Around the corner of the room to the right is a large table with a cast iron pot containing a sample of juniper berries, a bookcase leaning against the wall filled with ruined books, and two food barrels. Lastly there are two chests, an unlocked chest on the east wall and a master-locked boss level chest on the south wall. At the top of the west stairs there is a dresser on your left. At the top of the east stairs is a table with a dead imperial next to an iron dagger. At the corner of this level that overlooks the room below is a barrel and crate with a wolf pelt on it. There is another tanning rack on the upstairs level, and several hides are stretched on drying racks. In the northeast corner next to a bench is a set of shelves containing a leek and an iron mace. Against the northern wall is a cupboard with a knapsack on a shelf. To the left of this is another table holding a snow bear pelt, a pickaxe, and a copy of the One-handed skill book, The Importance of Where. To the left of this, in the northwest corner is a corridor heading west. There is a bleeding crown and blisterwort growing along this corridor, the end of which is blocked by a cave in. Before the cave in is a doorway on the right leading to the kitchen area. This is guarded by a Silver Hand who is warming himself in front of a fire. As you enter this room there is a hay bale on your right with a sample of wheat on it, and a cast iron pot containing two slaughterfish eggs and a sample of scaly pholiota. There is a woodcutter's axe to the right of the fireplace and a cast iron pot containing a rock warbler egg and goat cheese wedge on the hearth. Opposite the fire against the west wall is a table holding a random potion, a wooden plate containing a salmon steak, a salt pile, and a copy of the Smithing skill book Last Scabbard of Akrash. To the right of the table is a corridor heading downstairs. In the northwest corner of this room is a workbench with an anvil beside it. An adept-locked door is on the north wall. The locked door leads to a bedroom with four single unowned beds in. Beside the first bed is a wooden block with a bowl containing four gold coins and a full petty soul gem. Against the north wall is a dresser with a large coin purse, a thistle branch, and two leveled healing potions on top. Next to this is an unlocked chest. Take the corridor down the stairs to the west. At the bottom of the stairs is another cave in with an imp stool and fly amanita growing there. The path turns to the north past an overturned bench and leads to a small square room with a cupboard leaning against the north wall. To the left of the cupboard is a closed wooden door leading to the final room. When you open the door you will see a large circular room with stone pillars around the room. Two Silver Hands in front of you are using a tanning rack, another Silver Hand is off to the left sitting by a fire, and their leader is standing at the very rear of the room. If you are here for the quest "The Silver Hand", the leader will be Krev the Skinner; before, it will be a generic Silver Hand boss, and after, it will be a respawned Krev the Skinner (see Notes). To your left is a skeleton with an iron greatsword, a pair of iron boots and a banded iron shield laying next to it. To the right of the door you entered through is another closed wooden door. To the left of this is a cupboard. In the center of the room is a raised section with two short sets of steps leading up to it. There is a tanning rack between the two sets of stairs. On the raised section is another tanning rack. There is a third tanning rack at the rear of the room with a dead werewolf laid out to the right of it. To the left is an unlocked chest with a table beside it holding a random potion. There are ten hanging moss growing from the ceiling around the room. Exit the room via the east door. When the path turns to the north, you will be facing a lit brazier surrounded by a set of banded iron armor, a knapsack, and a pair of iron boots. A steel war axe is embedded in an archery target above the fire next to an iron helmet. The corridor turns back to the east and leads to the barred door found earlier that provides a shortcut back to the exit. Be careful on your way out as another Silver Hand has entered since you arrived and is often found sitting in the room with the cooking skeever. After being killed in "The Silver Hand", Krev the Skinner will eventually respawn with the rest of the dungeon. 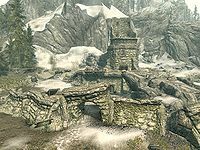 This issue has been addressed by version 1.3.1 of the Unofficial Skyrim Patch; a generic boss will spawn instead. This page was last modified on 22 November 2018, at 03:49.